This weekend Polaris RZR® Factory Racing Team captured eight first-place titles in the final race of the WORCS race series in Primm, Nevada. Racing in the RZR® RS1 and RZR XP® Turbo S, Ronnie Anderson, RJ Anderson, and Jessy Nelson dominated the podium, claiming first-place in the Pro Stock, Pro Turbo, and 1000 Stock classes. Ronnie Anderson's stock RZR RS1 was superior in the competitive landscape and secured first place in the Pro Stock course, Pro Stock Desert and Pro Stock World Finals classes. RJ Anderson's near stock RZR XP Turbo S dominated the field in the Pro Turbo Desert and Pro Turbo World Finals, and secured second in Pro Turbo Short course. Teammate Nelson's stock RZR RS1 outperformed his class, clinching a first-place finish in the 1000 Stock Short course, 1000 Stock Desert and 1000 Stock World Finals classes. "The Polaris RZR Factory Racing Team has relentlessly shown success this race season, and the WORCS World Finals solidified the dominance of this team," said Kyle Duea, vice president of ORV Marketing at Polaris Industries. "It has been a privilege to watch the team compete and win, and we are looking forward to support their continued success during the 2019 race season." 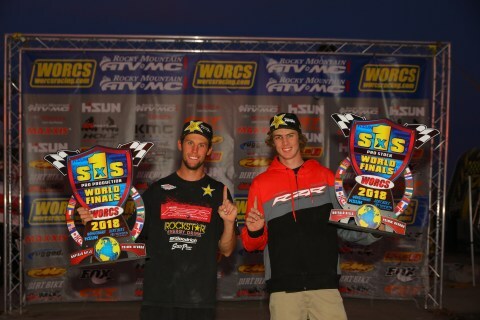 Polaris' own Cody Bradbury secured Pro Turbo Series champion and David Haagsma took home the second-place title in the series. Polaris RZR RS1 Stock team swept the podium with Beau Baron, Corbin Leaverton, and Matt Hancock taking home the championship, second place and third place titles, respectively. Polaris Industries Inc. (NYSE:PII) is a global powersports leader that has been fueling the passion of riders, workers and outdoor enthusiasts for more than 60 years. With annual 2017 sales of $5.4 billion, Polaris' innovative, high-quality product line-up includes the RANGER®, RZR® and Polaris GENERAL™ side-by-side off-road vehicles; the Sportsman® and Polaris ACE® all-terrain off-road vehicles; Indian Motorcycle® midsize and heavyweight motorcycles; Slingshot® moto-roadsters; snowmobiles; and pontoon, deck and cruiser boats. Polaris enhances the riding experience with parts, garments and accessories, along with a growing aftermarket portfolio, including Transamerican Auto Parts. Polaris' presence in adjacent markets globally include military and commercial off-road vehicles, quadricycles, and electric vehicles. Proudly headquartered in Minnesota, Polaris serves more than 100 countries across the globe. Visit www.polaris.com for more information.